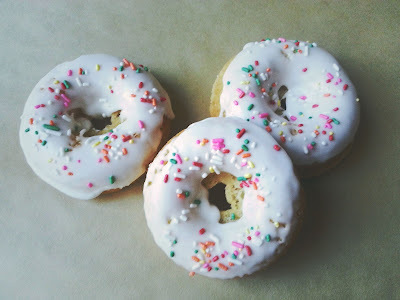 Here's a vegan version of my favorite baked donuts! They are just as great tasting as my other recipe but without all the cholesterol, and hormones... aka dairy. Definitely don't need that! And they are even easier to make. 1. Preheat oven to 375°, and lightly grease 2 donut pans with non stick spray. 2. In a large bowl sift together flour, sugar, baking soda, nutmeg and salt. 3. In another bowl combine milk, oil, vinegar and vanilla. 4. Add wet ingredients to dry and fold together until just combined, careful to not over mix. 5. Spoon batter into prepared donut pans and bake for 10 minutes. 6. Remove pan from oven and let cool. 7. Dip tops of donuts into icing, allow excess to drip off, and add toppings before icing sets. Whisk sugar and plant milk together until smooth with no lumps. If dry add more milk one teaspoon at a time until desired thickness is achieved. ***All of these ingredients can be purchased from Thrive Market. It's my favorite way to save money on quality ingredients and it's super convenient to shop online and have my items delivered straight to my door.